I’ve been on something of a quest to have someone run some kind of FATE game for me that I might enjoy. I’ve not yet really experienced the system in a way that left me with a positive impression, much like my endless frustrations with the Apocalypse World Engine. This looks very much like a FATE game I might enjoy, if the right person ran it and the right folks played. It’s based on the highly acclaimed superhero novels by Marion G. Harmon – who, incidentally, is the lead writer and designer for the RPG as well. What if the world changed? Ten years ago, everything did. The world we knew ended with The Event and the appearance of hundreds, thousands of superhuman individuals—ordinary men and women empowered in the blink of an eye, between one breath and the next, transformed or given extraordinary gifts. With this gamebook, you can take on the roll of a superhuman—a breakthrough—who has chosen to “wear the cape” and become a superhero. Or at least come as close to one as you can in a world with legal institutions that are averse to the idea of super-powered vigilantes! 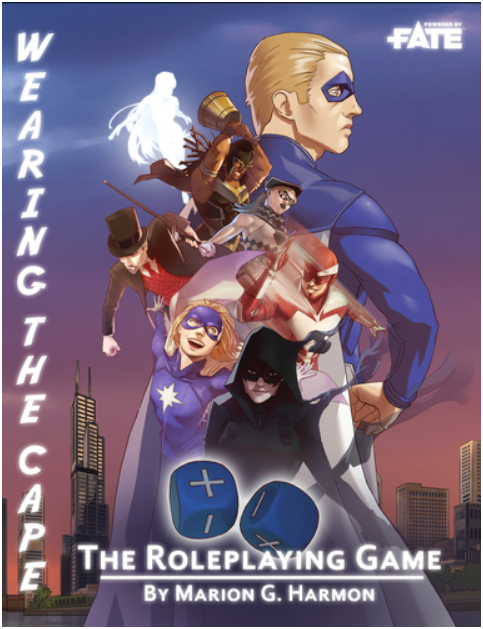 Built on the FATE CORE system by Evil Hat Productions, Wearing the Cape: The Roleplaying Game uses an open system of Aspects, Ratings, and Stunts to describe any conceivable character and superhuman power, as well as organizations, cities, regions, and any kind of environment the heroes may encounter. 220 pages of gamebook, with 30 dense pages of Post-Event World background to provide endless ideas for locations and threats, Wearing the Cape: The Roleplaying Game is a gateway for anyone who wishes to adventure in the world of the novels, or who wishes to make a world of their own! I am a backer of the game and one of the play testers. I am aware that FATE is not for everyone and has some fairly strong feeling on both sides of the fence. With that said, I really enjoy Mr. Harmon’s novels and the world he has created. He has taken the FATE Core system and “hacked” it to work for his Capes and I have enjoyed playing the system immensely and would recommend it to others who are either fans of FATE or would like to experience the Supers/Capes with the FATE system.